AP-20 Aspirating pump with carrying case, two rubber tube connectors, a container of lubricant, and an instructions sheet. SGD-BK-346 Consists of a pressure regulator-flowmeter with CGA 346 cylinder connection, the specially calibrated flowmeter that provides ease of measuring carbon monoxide, carbon dioxide, oil mist, oxygen, and water vapor, an adjustable wrench, a timer, a tube tip cutter, and instruction manual. Note: Detector tubes are not included and must be ordered separately. 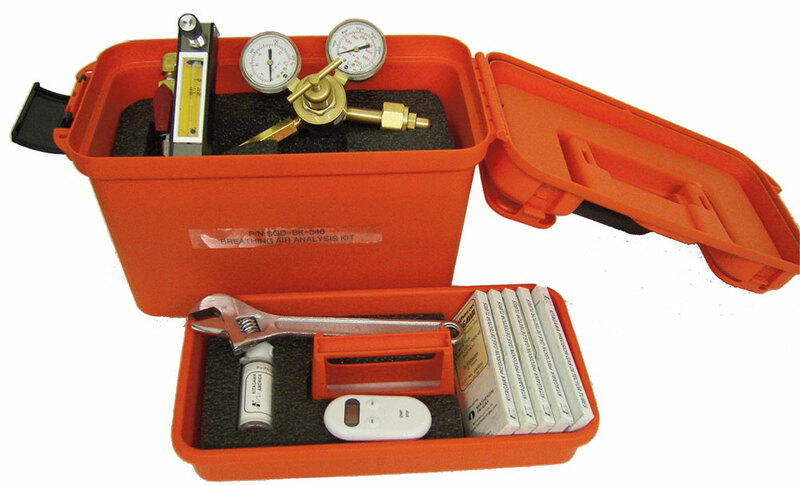 SGD-BK-590 Consists of a pressure regulator-flowmeter with CGA 590 cylinder connection, the specially calibrated flowmeter that provides ease of measuring carbon monoxide, carbon dioxide, oil mist, oxygen, and water vapor, an adjustable wrench, a timer, a tube tip cutter, and instruction manual. Note: Detector tubes are not included and must be ordered separately. SGD-BK-P4M Consists of a pressure regulator-flowmeter with 1/4” NPT male inlet connection, the specially calibrated flowmeter that provides ease of measuring carbon monoxide, carbon dioxide, oil mist, oxygen, and water vapor, an adjustable wrench, a timer, a tube tip cutter, and instruction manual. Note: Detector tubes are not included and must be ordered separately. SGD-BK-SCUBA Consists of a pressure regulator-flowmeter with a standard scuba yoke connection with a bleeder valve, the specially calibrated flowmeter that provides ease of measuring carbon monoxide, carbon dioxide, oil mist, oxygen, and water vapor, an adjustable wrench, a timer, a tube tip cutter, and instruction manual. Note: Detector tubes are not included and must be ordered separately. AS-1 Air flow indicator kit. Spot test system to determine the direction of air flow. Kit consists of aspirating bulb, carrying case and one box of No. 300 tubes. SA-10 One-hand operation switch. This device is useful for sampling on a ladder or narrow spaces where two-hand operation of the pump is not practical. B-191 Tube tip cutter – provides a safer means of removing tube tips. Pieces do not scatter and are accumulated in the container body. BOOK Kitagawa detector tube handbook. ** A 50 ml plastic syringe and a 1 meter vinyl tube are optionally necessary.